I have a small addiction for Bastogne biscuits, and when a new package of Bastogne biscuits is being opened in my kitche, I have to hide them, so they do not disappear too fast. 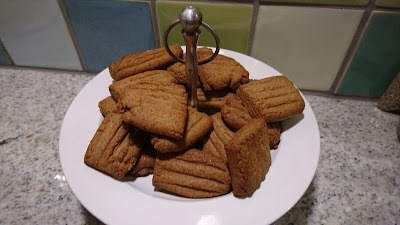 I have found this recipe on Bastogne kiks, which I have no made changes to. During the baking process, my new taste modification were jumping into my mind, so sooner or later I taste new modification with you. Mix the brown sugar and marble syrup together in a medium mixing bowl. Add in the butter, and whip it together using an electrical mixer. Add in the flour, lemon zest, ginger, salt, vanilla sugar, cardamon and baking powder into the mixing bowl, and whip gentle. Finish off by knead the dough together by hand to bring the dough together entirely. Place the dough cold in the refrigerator for minimum 1 hour or longer. Heat up the fan oven to 180'C. Cover the baking tray with baking parchment. Divide the dough into 2-3 smaller portions. roll out each portion by hand to longer rool with a diameter of 1½ cm. Press the roll flat using a fork to give the biscuit a pattern. Cut each roll into a length of 3-4 cm. Place the buscuits on the baking trays with a good distance between each biscuits. Bake the Bastogne biscuits at 180'C for 10-12 minutes. Cool down the Bastogne, before they are placed in an airtight container.